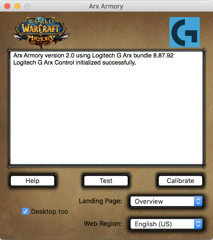 Target a player in WoW, click a button, and this app will summon that player’s Worldofwarcraft.com™ info page. 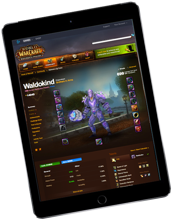 Target an NPC, click a button, and in an instant see the Wowhead.com™ info page for that NPC. The web pages open in the background ready to review when you have time. Combine with Logitech’s LGS Arx Control to make the info pages appear on your WiFi-connected tablet or phone. The web pages will appear in separate tabs, in the background. Simply Alt-Tab to the browser to check them out when you have time. Access character and NPC information in your local region and local language. ﻿Jump ﻿directly ﻿to ﻿the ﻿info ﻿you ﻿want ﻿to ﻿know ﻿most. ﻿Need ﻿to ﻿know ﻿more ﻿about ﻿that ﻿player ﻿who ﻿wants ﻿into ﻿your ﻿raid? ﻿Choose ﻿Raid ﻿page. ﻿Want ﻿details ﻿on ﻿that ﻿PvP&apos;er ﻿who ﻿just ﻿nailed ﻿you ﻿to ﻿the ﻿wall? ﻿Choose ﻿PvP ﻿page. ﻿Want ﻿to ﻿know ﻿a ﻿boss&apos; ﻿loot ﻿table, ﻿or ﻿quickly ﻿see ﻿strategies ﻿to ﻿down ﻿him? 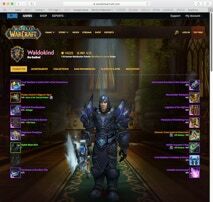 ﻿Target ﻿that ﻿boss ﻿or ﻿any ﻿NPC ﻿and ﻿activate ﻿ARX ﻿Armory ﻿to ﻿pull ﻿up ﻿the ﻿wowhead.com ﻿info ﻿page. ﻿You’ll ﻿find ﻿the ﻿WoW ﻿community ﻿has ﻿posted ﻿some ﻿amazing ﻿trivia ﻿about ﻿thousands ﻿of ﻿NPCs ﻿in ﻿the ﻿game; ﻿this ﻿app ﻿unlocks ﻿it ﻿all ﻿in ﻿the ﻿most ﻿intuitive ﻿way! ﻿Installation ﻿and ﻿calibration ﻿instructions ﻿are ﻿included ﻿with ﻿the ﻿download.